The Senate bill to repeal the Affordable Care Act would increase the number of people without health insurance by 22 million by 2026, a figure that is only slightly lower than the 23 million more uninsured that the House version would create, the nonpartisan Congressional Budget Office said Monday. Next year, 15 million more people would be uninsured compared with current law, the budget office said. The results can be seen in the above graph. Under this legislation, starting in 2020, the premium for a silver plan would typically be a relatively high percentage of income for low-income people. The deductible for a plan with an actuarial value of 58 percent would be a significantly higher percentage of income — also making such a plan unattractive, but for a different reason. As a result, despite being eligible for premium tax credits, few low-income people would purchase any plan, CBO and JCT estimate. 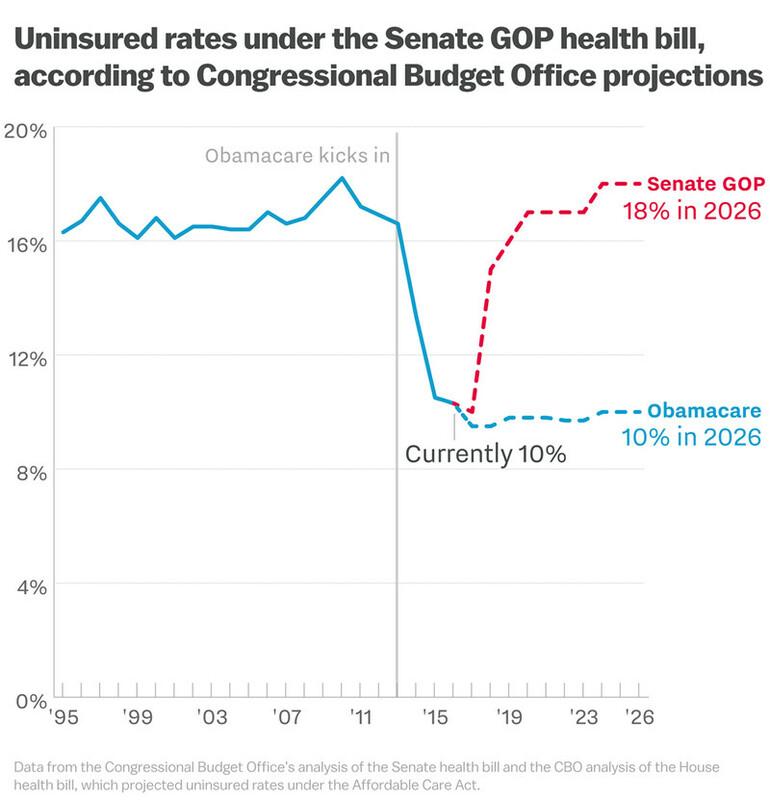 The plan also fails to lower premiums for most people, or help to increase the number of insurance plans offered. In other words, it fails to solve the problems which Republicans criticize Obamacare over. The Republicans face two fundamental problems in trying to develop their own health plan. The first is that Obamacare is essentially the Republican alternative to Hillary Clinton’s health care plan. Obamacare does more than the old Republican plan to regulate insurance companies, but the basic structure is the same. Republicans widely supported the individual mandate and the other aspects of Obamacare which they now attack before it was proposed by Obama. This forces them to come up with something different, and there really are not that many ways to handle health care coverage. The other problem is that the problems we now see on the individual market were not created by Obamacare. Insurance coverage has always been expensive for those buying coverage on their own, as opposed to being in an employer or government plan, provided that the insurance provided decent coverage. The market has never been able to solve this problem and the only realistic options short of a single-payer plan are ones which involve further government involvement, such as a public option or Medicare buy-in. Republicans are not going to back this. It is also questionable if enough Republicans will back their current plan for it to even pass in the Senate. Posted in Barack Obama, Congress, Health Care, Republicans. Tags: Barack Obama, Congress, Health Care Reform, Republicans. RSS feed for comments on this post.. TrackBack URL.